Stone floors have been around since the Pyramids were built, and yet designers still manage to create something new and fresh each season. Here are a few of the stone floor trends for 2014 that we’re loving in the Surrey Marble and Granite office. Square is yesterday. Trendy tiles now come in a wide range of shapes and sizes, including long, thin rectangles, hexagons and wedges. Even more exotic shapes are available to special order. For a smooth effect, it’s essential that the shapes tessellate, which is to say fit together without gaps (circles don’t, squares do – try it at home!). Chessboard, diagonal lines or something more complicated, black and white floor tiles are always striking. With the right stone, they can be sophisticated or whimsical, and the pattern is yours to select. Stone tiles are laid by hand, so it’s easy to create a custom pattern for your home or garden. While geometric patterns are always popular, less rigid stone floor tile designs are coming to the fore. An asymmetrical mosaic is a design that doesn’t repeat in a neat pattern – unlike the black and white chessboard mentioned above, in a asymmetrical design knowing what the sequence has been so far won’t necessarily let you predict what the next tile should be. 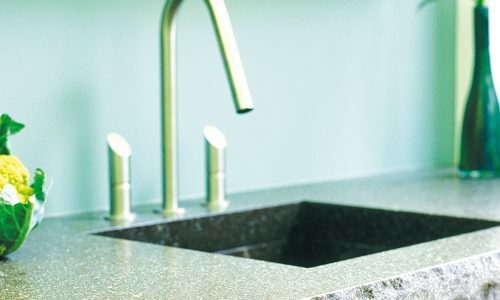 It’s a great way to create a homey feel with natural stone, or a vivid, modern look with brightly coloured processed stone. It’s ideally suited to smaller stone tiles. 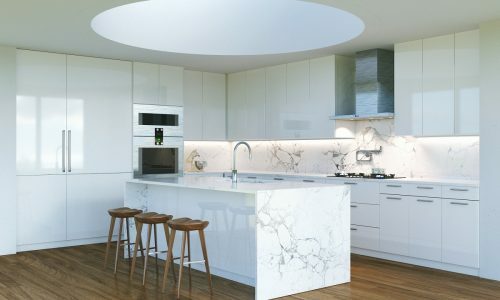 Particularly effective with natural stones, large tiles or slabs give a room a stable, grounded look and really highlight the beauty of the stone. The trend is for a single colour stone completely covering the floor. In bathrooms, large tiles are often used on the walls, too, creating an integrated look. Historic patterning techniques are making a comeback among home owners looking for a more sophisticated, luxurious design. Marble tiles are being used in traditional patterns, such as herringbone and basket weave, to create a subtle yet beautiful effect. These patterns can be achieved in either one shade, letting the pure natural beauty of the stone shine through, or in a mix of colours. While work tops are bold and dark this season, trendy stone floors are pale and elegant. A delicate grey or a blushing barely-there pink stone floor is the ideal backdrop for a statement counter top, bath tub or sofa. A major advantage of this trend is that pale stone in neutral shades never goes out of fashion. Take a trip to London and you’ll spot pale marble floors in historic rooms in Buckingham Palace and they’ll still be elegant and timeless when we’re installing them on Mars.